I’ve seen a lot of photos of water splashes and thought, “why don’t I try?” So, here is one of the shots I ended up with after about two hours of setup and shooting. If you’ve ever wanted to try, here is how I set this up and the things I would change if I were to do this again… which I will do… eventually. I found a clear, glass bowl and filled it with water. I wanted to have something cool appear in the splash, so I made a checkerboard pattern large enough to fill the whole frame using four 8.5″ x 11″ sheets of paper taped together and matching up with the pattern. I focused my camera on the center of the bowl, set my aperture to 1.8, using my 50mm lens, and hooked up a shutter release cable to my Canon Digital Rebel (I don’t recall the final shutter-speed or ISO, but I imaging a fast speed and sensitive ISO in order to stop the motion). In order to give myself the best lighting, since I only had an on-camera flash, I did this outside in my backyard. The challenging part was figuring out timing. 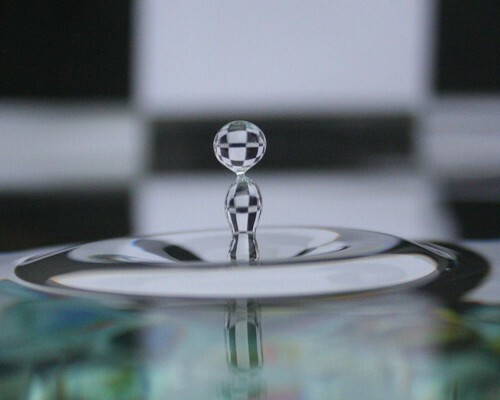 I dropped a marble into the water and pushed the shutter-release cable when the marble hit the water. Many were too early, most were too late. But about a dozen came out like that one, with different shapes, lengths, ripples and size. Once I brought the camera inside to see what I had captured on the larger monitor, I cropped in a little closer on the splashes and got what I deemed a decent finished product. However, I am open to any pointers or best practices on how to capture this better, or create other effects of water splashes for the next time I give this a go. Really nice first attempt! I too have been reading about this recently and want to give it a go. Thanks. If you do give it a go, I look forward to seeing how they turn out.